Not sure if this is appearing on national news, and I guess I won’t find out for another hour or so, but if you have seen http://www.wmur.com/news/14737868/detail.html?treets=man&tml=man_break&ts=T&tmi=man_break_1_12260411302007 — yes, Rochester, NH, is where we live. I found out about this when attempting to run a couple of errands downtown — pick up a finished cross stitch, and drop some sheets off at a local laundromat (we don’t have a dryer, and it’s below freezing outside). All the local stations have been running this story, and the inaccuracies I’ve heard — our fanciest restaurant described as a “bar,” a 72-hour drinking bout on the part of the hostage-taker described as a 48-hour drinking bout, his “being Known to police” (as in, “Oh, yeah, this guy has a major criminal record”) being the result of having grown up with half the cops on the force — well, it’s been an Education, in terms of just how accurate the media is. But you already knew that, right? 😉 I mean, look what they do to Orthodoxy…. I should add that no one seems to know quite why he picked on Hillary’s campaign headquarters, but it seems perfectly clear to me that surely, he is of the opinion that the fewer Hillary supporters there are in the world, the better. Not that I would advocate this particular method of reducing their numbers, but I have been truly astonished by the number of brainless idiots — I mean, Hillary supporters there are in these here parts. My secret hope is that this will convince the Democratic Party that this woman is way too controversial to be electable, and they will hand the nomination to someone with at least marginal brains. (Naming no names here…) But I’m not too convinced that that will actually occur. Meanwhile, I sure hope I can get my sheets taken care of tomorrow. Sigh. Commitment to Loveliness. Or Something Like It, Anyway. a fun way to increase femininity and beauty in our lives each week without even trying! All you have to do is choose five things that you would like to work on or do during the week that will increase the loveliness in your life! 1. Listen to more good music. We’ve gotten into a rut lately of watching television, and although we don’t watch too many of the network offerings, we do have a rather large library of tapes and DVDs. Time to put them on hold, for this week, at least. 2. Make a point of tidying up the house. With all that goes on around here, it’s too easy to give the featherbeds a fluff and say, “I’ll make the bed properly later.” Or to stash the plethora of catalogues out of sight and say, “I’ll get to that later.” Not this week. 3. Make an appointment to get my hair and nails done. I started having my nails done a few months back, after literally years of neglect, and ya know? It feels pretty darn good to look civilized. 4. Sing Matins and Vespers regularly. With Jim home so much lately, it’s been too easy just to read the prayers, or not to say them at all. But this time of year has some of the loveliest music in all Orthodoxy. 5. See if I can actually go a week without using slang. This will be a tough one. New Yorkers speak better slang than they do English. Once you have chosen five simple things, post them on your blog and link to this post in your post, and then post the direct link to your Commitment to Loveliness post in the comments section. This looks like it could be fun! Some time ago, when I mentioned on the OrthWomen’s list that I had a daughter, someone responded that she hadn’t known I had a daughter. This post may explain why I don’t generally talk about her. This isn’t the first time she’s trashed her father and me on this blog (which she knows I read), and there was a period of about three years when she didn’t want anything at all to do with us. During that period, she initially had my whole family convinced that the problem was me, and the way I was treating her, but over that period of time, people who got to see us together formed a totally different picture, and sadly, my daughter has no credibility in my family anymore. Obviously, with her friends, it’s a different story. My husband is in favor of telling her off, loudly and clearly, and breaking off relations altogether. I just don’t know. Part of me wants to say, “OK, enough with the lies.” But a larger part of me references the example of St. Nektarios, who lived under the cloud of slander for, what, 30? 40? years of his life? and died under it. Only after his death was he revealed as a saint, and only after his death was the slander exposed for what it was. What’s better — to endure, and keep praying for her, hoping that she corrects herself? Or to call her on it? Well, at least he made it home for Thanksgiving dinner, but had to return to work today. We had him a scant 24 hours. But this time last year, he was home for five days, and then we had to put him on a train and ship him back to Philly for another month. It was so hard to see him get on the train, knowing he was going back to a half-life that he absolutely detested. We didn’t even know that the job he has now was in the offing. So at least he’s able to be with us somewhat more often this year, which was my big Thanksgiving focus. Face it — we got spoiled, being able to see him every weekend when he was working days. He’s been on nights since September, and expects to continue on nights till January. After that, who knows? The biggest downside to nights, besides lousing up his circadian rhythm, is that he can’t get to church because he doesn’t get in till sometime after midnight — he works from 4:00 p.m. until anywhere between midnight and 4:00 a.m. — then just crashes till about 10:00 or so. And the nearest church is 25 miles away. I hope he doesn’t lose track altogether of his spiritual life; he’s been such an inspiration to so many people in his faithful church attendance. …as usual. Yes, I’ve been Very, Very Quiet of late, and this picture is why. Now, there’s a story here. (Otherwise, why blog about it?) I bought this back in either 1989 or 1990 so I’d have some needlework to occupy myself with in the summer months — in those days, I was BIG into knitting, and face it, wool just isn’t what you want in your hands when it’s 90 degrees in the shade with 100% humidity. So, traipsing around the Windsor Button Shop, a wonderful store which has sadly gone out of business — they couldn’t afford the rent at the local mall — I spotted this and picked it up. Hey, it has sheep, right? What knitter doesn’t have a love affair with sheep, if only in theory? So I bought it and started work on it right away. By 1990 or 1991 — I rather think I started it in 1989, so progress would have been by 1990 — I had the words all in, and the line border. Then I set it aside — time to get back to knitting — and forgot all about it. 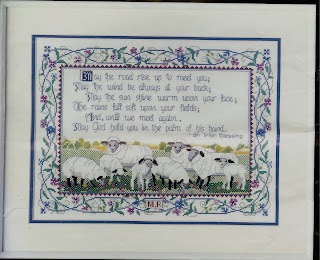 In 2001, feeling horribly depressed over a number of things including Empty-Nest Syndrome, I rediscovered cross stitch, picked this back up, and filled in all the sheep and the background. Then I was stumped — I knew that the floral border would require a good deal of finicky work — so I set it aside again. In the meantime, I discovered the wonderful world of internet groups, including a couple of cross-stitch groups, and these taught me hitherto-unknown techniques like the pinhead stitch for starting and ending needlework, the loop method of starting, and “parking” threads so that it’s possible to work on really complicated projects with multiple colors of thread without losing one’s mind. In October of this year, I had to attend a conference for tax collectors — what needleworker in her right mind travels without a project?! (On the other hand, who said I was in my right mind….) This was my designated Travel Project (shows how much travel I do), so I flung it into the van and headed up for three incredibly boring days, about which I have already blogged. After, what, 18? 19? years — I could finish this thing. I got it done last night. On Saturday evening, dh and I watched “The Hunt for Red October” on AMC — we have it on video, but this was a letterbox version with captions underneath that made little esoteric notes about the movie. I can’t help wondering if this was a complete accident, or if somebody over at AMC was aware that November 7 was coming up, the anniversary of the 1917 revolution (which took place on October 25, according to the Old Calendar, thus the references to “October” when discussing this particular event). Since the fall of the Soviet Union, November 7 has been a source of considerable tension in Russia. On that day, the dwindling Communist faithful gather to remember their lost glory — it doesn’t seem to have occurred to them that they are enjoying a right they certainly denied to their own opposition! — and grumble and mutter about how the world is going to the dogs, or something like that. Anyway, the Russian president, Vladimir Putin, has replaced November 7 with November 4, the “Day of Russian Unity.” The Day of Russian Unity commemorates the day the Russians drove the Poles out of Moscow in 1612, during the Time of Troubles in between Tsar Ivan IV (“the Terrible”) and the rise of the Romanov dynasty. My friend Dimitra has blogged about this new holiday, and notes that it is also the feast of the Kazan icon of the Mother of God — which played a significant role in the driving out of the Poles. So I shall think of this new holiday as “Gold October,” since I almost never think of the Theotokos without thinking of that line from Psalm — 44, I think it is — “At Thy right hand stood the Queen, arrayed in a vesture of inwoven gold.” The icon above, of the “Golden Tikhvin Theotokos,” is what’s in my mind. Dimitra, I should note, is currently living in Russia and teaching English. Can you imagine actually being able to live in an Orthodox country?!?!? !